I just would like to know when we will have 2TB SSDs from Samsung. Some of the competition has it already, but at an impossible price. Either way, there's not really a technical reason why we don't have huge SSDs, it's more of a cost issue and what the market wants to buy. Client or entreprise, both, really. 1TB is just too small for today needs. A 2TB+ SSD has a huge market potential. And why, for instance, WD has not invested his profits in manufacturing his own NAND/V-NAND memory for SSD? Is it really that complicated and/or expensive? All that WD has is a hybrid, 120 GB SSD + 1 TB HDD. How a company like that could survive in the future? Seems that we have too little of needed competition in this market, really. And that's a HUGE maket that we are talking about. Hah, yes, it's billions to make a fab. I've railed against them for not doing it too, Seagate as well for that matter, and while I think it's silly for them to not be in the game, it's not a trivial decision. Many others have 1.6TB in the enterprise space, or larger. If you look at the client space, the volume is almost all in 120GB and 240GB capacities. Consumers and IT departments don't want to spend more. Need more storage? There's a cloud for that. Too small for _what_ exactly? Certainly not many applications in the consumer market, and I doubt that there are many in the enterprise market with a pressing need for that size of SSD. I have almost 50TB of storage on my home network and exactly 192GB of that is SSD. Frankly, that's all I need in very fast storage. The market potential for large SSDs won't be realized until they're much closer in price to storage on HDDs, which is currently many times cheaper. To small for everything, storage is like money: no one will complain about having more! It is really better to store anything in SSDs, from ISOs to raw images, full HD videos, torrents, etc. HDs gets hot, make noise and has a significant bigger power consumption. Cloud storage depends on monthly charges and internet links, which are and will be for a uncertain amount of time much slower than having data with you. I think you need a NAS and accept a little noise and power consumption to get flexibility and low cost/GB. Flash memory is not that great for long term storage, especially if unpowered. The contents get "stale" and you end up with "data decay". Next, with 10TB platter drives being announced, the cost per TB of storage will continue to be least expensive with rotating media. And while it's fun to watch a 20GB movie file copy at hundreds of MB per second, it's useless for most consumers. So SSD will continue to be aimed at OS/Apps, and HDD for mass storage. I have a 240GB SSD and is enough for my working environment. But I would like to use SSD to play games. It would be cool. To those saying we don't need the big SSDs: I'm looking for a 4-8 TB SSD for my laptop. Dreaming mostly of course, although as Brian mentions there's a 4TB Sandisk in the works - however that's got an SAS interface so can't quite fit it into the laptop at this stage. Why might I want such a big SSD as a (tech) consumer? The reason is I've got about 6TB of data (files, music, movies, and what not) and want to have it all on the same fast and light weight disk. Right now I have it split across various spindles (mostly 1 and 2 TB WD portable drives), everything doubled because they tend to fail fairly regularly. SSDs are lighter, and less prone to failure. Some people spend $50K or more on a car and use it half an hour a day, and trade it in three years later for another one after it has lost half its value. I use my laptop 8-12 hours a day, every day. So I don't care what I spend on hardware, as long as it's useful. I know 8 TB is probably not possible to fit into the 2.5" form factor right now, but 4-6 TB should be possible. If I then have to spend $5K or more on an SSD I'd happily do that. And I'm sure there's others out there with the same mindset. Ah and just noticed Intel is coming out with a 1.6 TB 2.5" form factor SSD in the S3500 range (and also a 1.2 TB one). It's not where I want it to be, but it's a start. Nobody is saying there's no need for large SSDs. They're saying that as long as larger solid state devices are so much more expensive per GB than comparably sized HDDs, there will be little demand for them in the consumer market. If you have 8TB of data to your name (most likely much of it consists of media files that are seldom accessed) then I can understand wanting to carry it all around on your laptop or tablet or on your smartphone. It's simple, it's neat. It's human nature to want it all at your fingertips. But then, what about someone else with 80TB or 800TB? You're not likely to be carrying that around in your phone for a few years ... it's going to be stored on HDD regardless. Agree JJ Johnson that there will be little demand in the consumer market. However there will be some demand - fanatics like me, similar to the people who buy the Intel enthusiast's CPUs. And yes most of my data volume is in media files (typically movies and music videos) which I don't often access. But still like to have it available for the times when I'm discussing this or that with someone, and simply would like to access it with a few clicks. Rather than having to find a spindle, attach it and wait for it to spin up, etc. by which time it has become an effort to locate the file. Even for the client space there's no technical barrier to 2TB SSDs or larger, it's just a question of cost. Some brands are seeing a big trend up in capacity though, in terms of their most popular sell through models. While some more value oriented brands are still at 120GB as the most popular SKU, higher-end guys we talk to are at 500GB. So it's not a stretch to expect someone to offer a 2TB next year at some point if that trend continues upward. I know it's not what you asked for, but there are 2 TB laptop HDs on the market now in 9.5mm. They'll fit in standard laptop drive bays. Newegg has several for $120 or higher. All apparently 5400 RPM. They're not SSDs, but you can buy them today. While waiting for the 2+TB SSDs. And Brian, yes let's hope the increasing median size for SSD's combined with the drop in per gig cost will spur some vendors into cramming more silicon into the 2.5" cases they sell to ensure the top end of their SSD product range remains profitable enough. 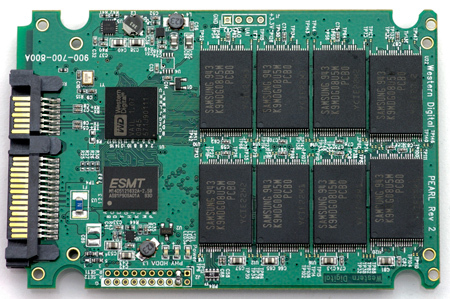 I'm hoping that Sandisk will add a SATA interface onto that 4TB 2.5" SAS SSD they've announced. Should be an easy thing to do for them and up the ante for everyone else..
Hah, they're not going to take Optimus Max to client systems any time soon, but they certainly could. I'd bet we'll have 2TB client SSDs next year though from Samsung and maybe Micron. SanDisk's client business isn't really that strong comparatively. Why settle for only 2TB if you have the budget? I missed this earlier. Last time I checked, I couldn't find a decay rate for unpowered SSDs. And to my knowledge, they aren't on a refresh strobe like DRAM. Is this for real - has a data decay lifetime been established for SSDs on the shelf? I have to ask, though .... In mission-critical applications, are many organizations really using HDD for long term offline storage? I'm thinking tape is still king for things like corporate backups, archiving and similar applications. Eventually, once flash memory becomes cheap enough, hard drives will vanish. There will just be very little reason for them to exist. It certainly won't be for mass storage applications. There's virtually no way that HDDs will increase in data density as quickly as flash. Indeed, with 16TB 2.5" SSDs available today, SSDs have already surpassed mechanical drives in storage density per unit volume.